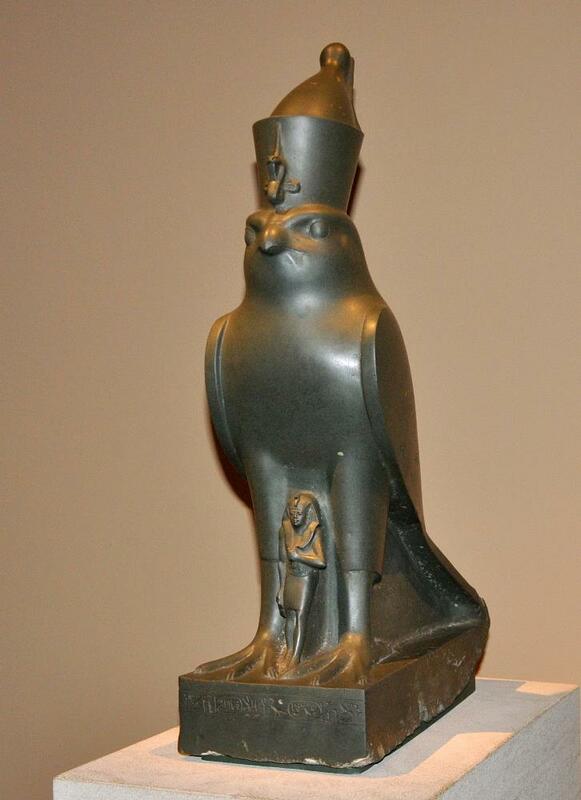 The god Horus, symbolized by the falcon, had a very close relationship with the Pharaoh in Egyptian mythology. Pharaoh was believed to be the god-king, and “was regarded as the god Horus incarnate” (Bible and Spade 1990, vol. 3, no. 4, p. 111). Our photo shows the Egyptian god Horus protecting King Nectanebo II. He reigned during the Late Period, Dynasty 30, 360-343 BC. This statue is said to be from Heliopolis, Egypt. Egyptian god Horus. Metropolitan Museum. Photo by Leon Mauldin. The king holds a sword in his left hand. This statue is on view in Gallery 128 in the Metropolitan Museum of Art, New York. Click image for larger view. This entry was posted on Tuesday, October 21st, 2014 at 1:56 PM and is filed under Bible History and Geography, Egypt, photography, Travel. You can follow any responses to this entry through the RSS 2.0 feed. You can leave a response, or trackback from your own site.